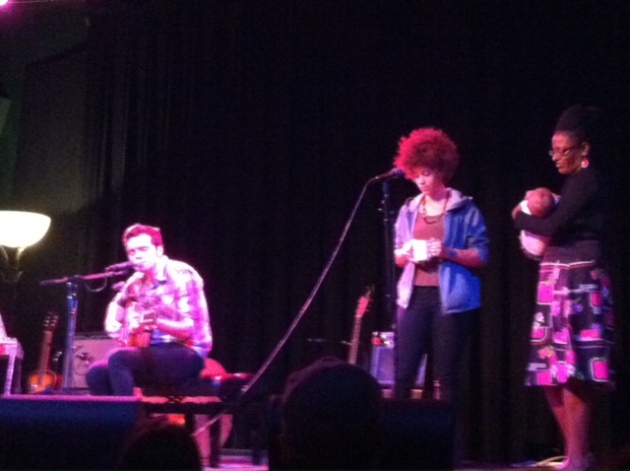 “This is a really good idea,” Ben Kyle noted a few songs into the first installment of the Song Exchange series at the Cedar Cultural Center on Sunday night. “But a bit nerve-racking,” he added. What made Kyle nervous was the fact that he had to sing three songs by another Twin Cities singer/songwriter at the show – and the songwriter in question happened to be there in attendance. The Cedar paired the Romantica frontman with Chastity Brown in a new series that’s as promising as last night’s competing final-season premiere of “Breaking Bad.” Each tunesmith rounded out their acoustic sets with a trio of the other one’s songs. Of course, that didn’t actually happen. Both the crowd and the musicians themselves seemed smitten with the interchange results. After talking about how Romantica was one of the first bands she fell in love with after moving to town in the mid-'00s, Brown played a particularly powerful, haunting version of the band's dark nugget “Ixcatan,” and then put a soulful twist on “Break.” Both singers also took the stage during the other’s set to sing backup, with Brown joining Kyle for “Simple Life.” He helped with her finale, “If You Let Me,” which turned into an “Amazing Grace” singalong. The show’s familial living-room vibe peaked when Kyle’s backup singer (and sister-in-law) Jayanthi Kyle brought her baby Saatchi on stage with her, after she started crying in the audience. “If you’re wondering who would bring a baby to a show,” Jayanthi cracked, “It was me.” Saatchi settled right back into a lull again on stage, though, as soon as her mom and uncle started singing again. Sunday's music had the same kind of cozy, warm effect on everyone in attendance. AUG. 18: Dead Man Winter with Charlie Parr. AUG. 25: Bomba de Luz with the Farewell Circuit.